quite understand how challenging this kind of "fishing" might be or how many different techniques would be utilized. The particular fish we sought today, copper sweepers, a.k.a. glassy sweepers (shown at right), was a case in point. 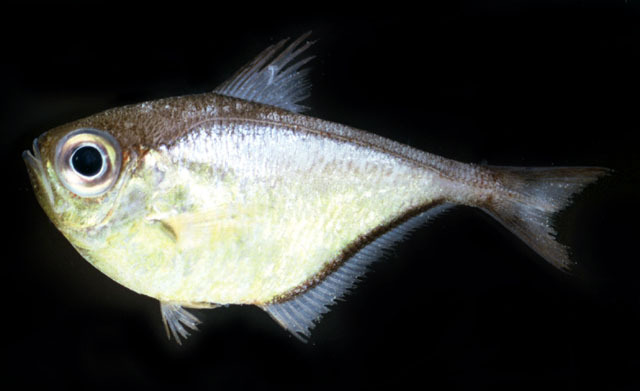 The copper sweeper (Pempheris schomburgki) lives in 15 to 80 feet of water, spending much of its time hiding from predators in the dark shadows of coral caverns. It's a small fish 3 to 5 inches long that seeks safety by congregating in large schools. So, how do you collect fish hidden in the dark depths of a coral cavern? You call on Capt. Lou, one of the two multi-talented skippers on the Coral Reef II. Aside from being a very skilled seaman, Capt. Lou is also a very accomplished collector. At Bond's Cay, Capt. Lou led a small group of divers down to a reef in about 20 feet of water. He headed in alone about went 50 feet back into a coral cavern that seemed to be a likely home to thousands of copper sweepers. It was also a likely home for a few deadly lionfish (shown at right), an invasive species proliferating all too rapidly throughout the Bahamas. Capt. Lou's technique is to watch the schooling sweepers for a short while to see the patterns of their escape attempts, and then block them off by moving in swiftly, but gently, with his two vinyl nets. He's a 6'2" former football player and killer whale trainer. There wasn't a lot of room for the fish to escape out the narrow passageway into the cave. Having caught five or six fish in one of the nets, Capt. Lou started handing the net out to two waiting divers, Sarah and Lewis. They held a 50-gallon black bag on the sandy bottom. With each net delivery out from the cavern, they would turn the net upside down above the black bag and hope the sweepers would bolt toward the dark depths of the bag, which is their natural response to danger. And, voila! Five or six deliveries later, the bag was full of copper sweepers. Now comes the hard part. Ever try swimming in 20 to 30 feet of water with a 50-gallon bag full of water? It's sort of like trying to run a marathon while carrying a water bed. But they managed, and once they reached the boat, Capt John (our other able skipper) and I lifted the bag up into a large cooler (ever try that at age 60?). Then each fish was gently transferred into one of the many holding tanks on the boat, complete with some synthetic "habitat" to simulate their natural environment. The final count: 37 fish are now destined for a new home in the Aquarium's dark grouper tank we call "the Blue Hole." There, millions of people will have the opportunity to see a fish that most SCUBA divers will never even knew existed. Oh, and did I mention today's menu? Would you believe corned beef and cabbage in the Bahamas? Flavored nicely with a touch of garlic and absolutely delicious. It was just what we needed after several dives and two hours working a seine net along the beach looking for needlefish. More on Chef Matt in a future blog. Blog #1: The Expedition Begins!